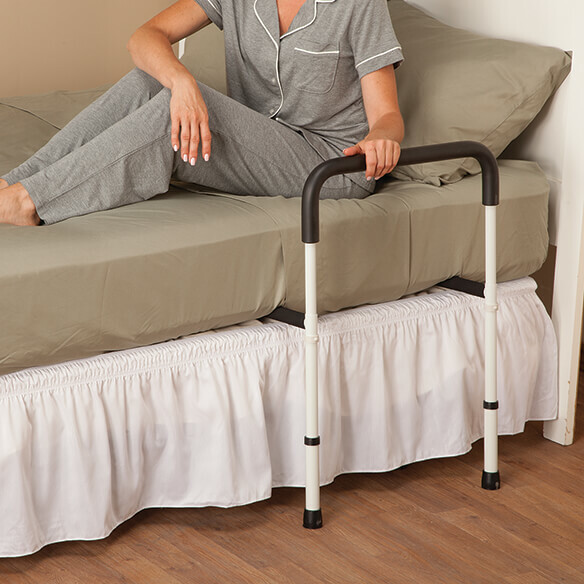 Easy-to-use steel bed safety rail lends a helping hand so you can get in and out of bed safely. Simply slide bed side rail under mattress on either side of bed; non-slip foam on base keeps it securely in place. Handle height adjusts 31"–38 1/2". Bed bar length adjusts 34"–45". Sturdy, all-steel safety bed rail easily wipes clean. Portable design weighs 8 lbs. This bed rail is perfect for my needs. Very sturdy and stable. The only problem was trying to assemble it from reading the printed directions. Best advise is to throw away instructions and assemble by sight! Using as a handle so my husband can more easily rise from bed. Also doubles as a slight reminder of the edge so he doesn't roll out of bed accidently. My husband is disabled and needs extra help getting in and out of bed. We just put this together and my husband loves it! We are both very pleased! Affordable and seemed like it will help my husband. For my mom that's elderly and needs assistance..
Good reviews. Adjustable to my bed dimensions. Value and weight limit it holds. To assist me to get safely in and out of bed! To safely exit and get into my bed. needed a simple bed rail for my mothers bed. This has worked out well. Need this to help me get out of bed. Needed to assist in getting into bed and out and rolling out of bed. To help a loved one who has problems getting out of bed. it was recommended by medical staff, and the pricing is very good. To help my mom be more maneuverable around her bedroom. Mom needs help to get out of bed safely. she has already fallen out of bed twice trying to get out and one day I found her in bed afraid to try to get out for fear of falling. This will help her and give her confidence and control. bought new bed and needed it. It was recommended by a health care provider. I needed this to assist getting myself up out of my bed because I have parksingson disease and my muscles need a little help with assistance from care givers to help get me up to shower and eat and get my day started. Bottom of mattress is only 10" off the floor on a lo pro frame and lo pro box. Will it adjust that low? or lower? BEST ANSWER: Thank you for your question. No, this item's height can adjust from 31"–38 1/2". We hope this information will be of help to you. Can it be used with adjustable bed? BEST ANSWER: Thank you for your question. 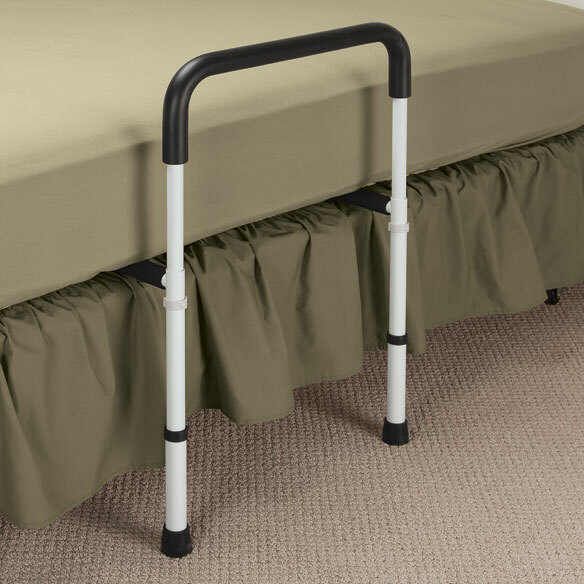 The Safety Bed Rail is designed for use on beds with a box spring and mattress. We hope this information will be of help to you. What are the min. & max. height adjustments for the bed bar? BEST ANSWER: Thank you for your question. Handle height adjusts 31"–38 1/2". Bed bar length adjusts 34"–45". It is 20"W. We hope this information will be of help to you. What is range of leg height adjustment, measured from floor to top of box spring? BEST ANSWER: Thank you for your question. All beds are made with different thicknesses. This item extends to 38 1/2 inches high. We hope this information will be of help to you. what is meant by Length adjusts? What is the difference of Length and Height adjusts? BEST ANSWER: Thank you for your question. The length is the measurement for the poles that go in between the mattress and boxspring. We hope this information will be of help to you. BEST ANSWER: Im sorry, Eleanor, I gave this to my niece who had back surgery and dont know how it worked. I did, however, own a sleep number bed and cant see any reason it wouldnt work. Thank you for your question. Yes, it should work with a sleep number bed, it secures underneath the mattress. We hope this information will be of help to you. Is the 20" W the bars that go between the mattress/box spring? BEST ANSWER: Thank you for your question. They are 20" w and adjusts 34"–45" in length. We hope this information will be of help to you.